**UPDATE** We filmed the video, folks!! 🙂 Check out the video tutorial over at the Eureka Crystal Beads YouTube channel! 2-hole Superduo Czech glass beads, 2 colors (I used Cherub Halo Qty=44 & Flax Metallic Matte Qty=23) Option to use just 1 color (Qty=67) if you wish. Notions: 6 ft. 6 lb FireLine Beading Thread, Size 12 Beading Needle, Beader’s Wax (optional), Scissors. *Size 11 Miyuki Seed Beads would be fine, too! Go through the 2 seed beads on the side you’re currently on, heading towards the body of your bracelet. Pick up a 6mm Swarovski Pearl and go through the top hole of the next side-Superduo >>image 5<< REPEAT this step down the entire side of your bracelet. Add the same 2 seed beads needed on either outside of the end-Superduo >>images 3 & 4<< just like we did on the other side. Travel back through the seed bead loop attaching your clasp so that way you can end coming out of the pair of seed beads (added in previous step) on the side of your bracelet still missing pearls. Add pearls all along the other side of the bracelet. End coming out of the top hole of the last side-Superduo. **Variation** Use 6mm Swarovski Crystal Bicone Beads instead of 6mm Swarovski Crystal Pearls for a flashier look!! **Sizing** To help with sizing, (42) 6mm Swarovski Pearls (21 down each side) created a bracelet that, not taking into account the clasp, was 7 1/2″ long. **Alternatives** Consider using 6mm Round Druk Czech glass beads instead of pearls! Or 6mm Firepolish if you want some texture but less sparkle than a crystal! Until next time!! Bead On, friends! Previous Post Products to Splurge on! Next Post Deep Summer Color Palettes… Get Inspired! Thank you so much for posting the lovely pearl bracelet pattern; as far as my own opinion (and learning style) goes, I always much prefer video instruction as I learn better by watching and then doing; reading the directions and then transferring the information from brain to hands is not very easy for me!! I really appreciate you asking for feedback on this topic and please continue to post (hopefully also in video format) your wonderful patterns! I love that this is a written set of instructions. Often when I bead, I do not have my computer with me for the instructions. I so much prefer to have it written out. I usually do not even look at a pattern if it is video only. I find it difficult to bead and pause a computer video to follow along. Thanks for the feedback!! I try to offer patterns and projects in different formats as we all prefer to learn in different ways! Video just tends to be easier to create as taking and editing pictures and writing out directions is very time consuming but it’s so nice to see that it’s so appreciated. 🙂 I’ll make it a point to provide more projects in written format! I think a video would be very helpful. Your videos are always a big help, very easy to follow. Love your color choices. Thanks for the feedback, Creeta! Your bracelet is stunning. I would love to see a video! Would love to have a video tutorial and to be able to print this out. That way if I don’t understand a step I can follow it on the video. It’s the best way to have these done. I always stop and go on video’s to try and write down what is being said but it never quite works out right. With this said how can I print out these instructions? Thanks for a beautiful bracelet. Hi Leah-This bracelet is a real beauty! Thanks for sharing, and wondering about the different ways we look at a beading pattern. If there is a video, I tend to watch it over and over again until I build up my nerve to try it!! Then, if there is a written pattern, I’ll check that against the video so I have a hard copy to refer to if the video goes away. 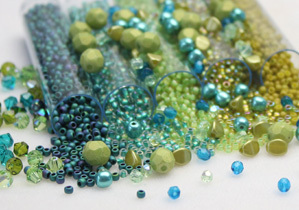 I know, a little on the strange side, however….Thanks again for sharing all your beading knowledge with us.